There are several cables that go with your pumps. The following table is a list of all the cables, their part numbers and their description and usage. 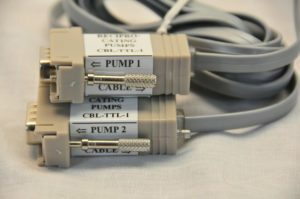 Are you looking to make your own pump cables? Are you trying to figure out what cables you need to connect your pumps to your PC? Are you an electo spinner or electro sprayer. See my post on High Voltage setups. This is a pump synchronization cable. For use with two pumps only. It is used with pump programs to create continuous infusion systems and dual infusion systems. 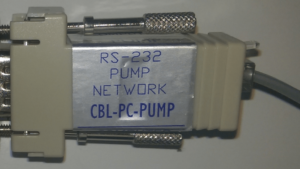 Used to connect from a USB-RS232 adapter to the first pump in your pump network. Used for creating a continuous infusion system, dual infusion system, or one of the other 2 pump automation modes. Replaces cable CBL-TTL-1, unless the use of the TTL ports for synchronization is preferred. 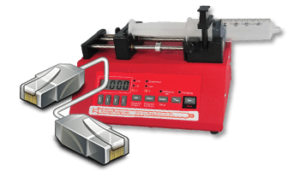 Can result in more responsive pump reactions – no RS232 transmission delays. Used to connect second pump and subsequent pumps in a pump network. 25ft (7.6m) Cables not long enough? 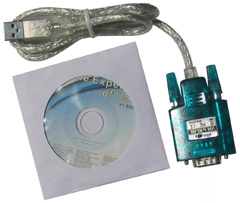 Connects to your PC via USB and provides modern reliable 9 pin RS232 port with buffering. Need your pumps and PC separated by more than 25ft (7.6m)? Thinking of MRI users in particular.